In Lviv coffee is the way of life. People like to sit down, read newspapers, have a chat with friends and the most importantly drink coffee at local cafés. 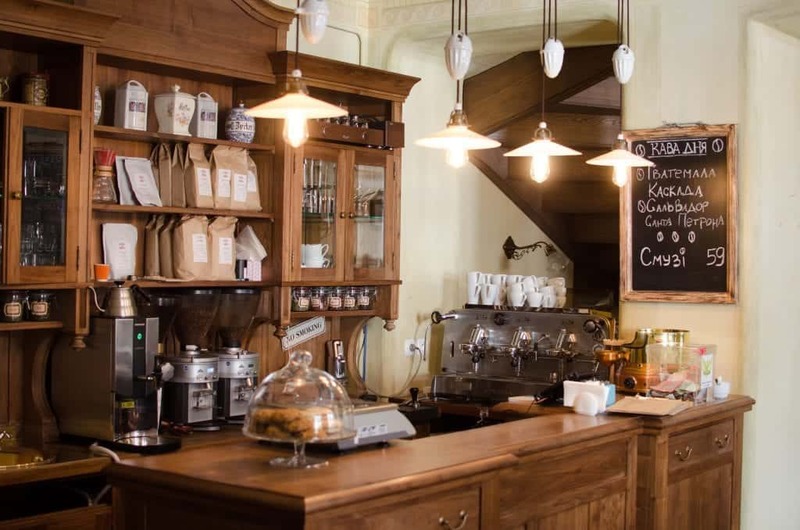 You would rarely find a café that serves take-away because people simply want to enjoy their well deserved cup of coffee. Brewing coffee in a czezve is the method you can expect at homes and we got to try a brew by the lovely Natalka Ostapyuk at Svit Kavy, the company that set standards for speciality coffee in Lviv and beyond. 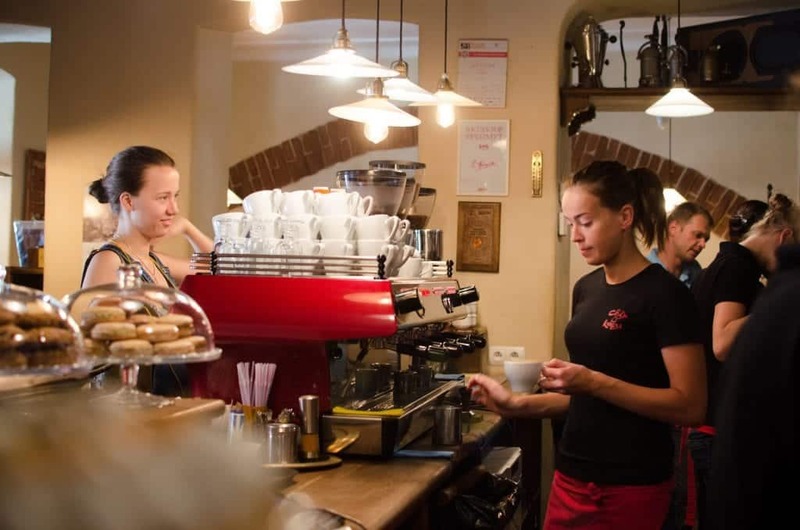 Why should coffee people visit Lviv? “If you want to really live your day and one part of the day is coffee, you should go to Lviv,” answers Natalka. 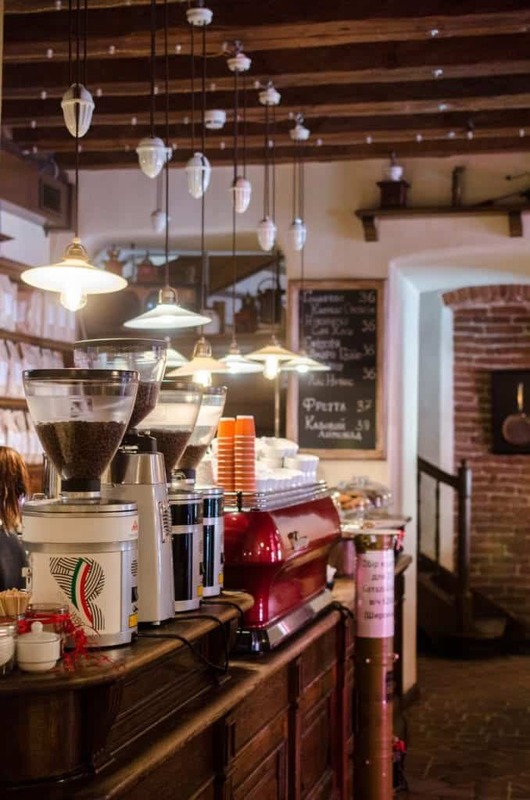 Blue Bottle, the first coffeeshop opened in Europe, was founded by an Ukrainian; a historical fact that makes every citizen of Lviv proud until nowadays. It was opened in 1686 by Jerzy Franciszek Kulczycki who was born in Kulchytsi, just 60 km from Lviv. 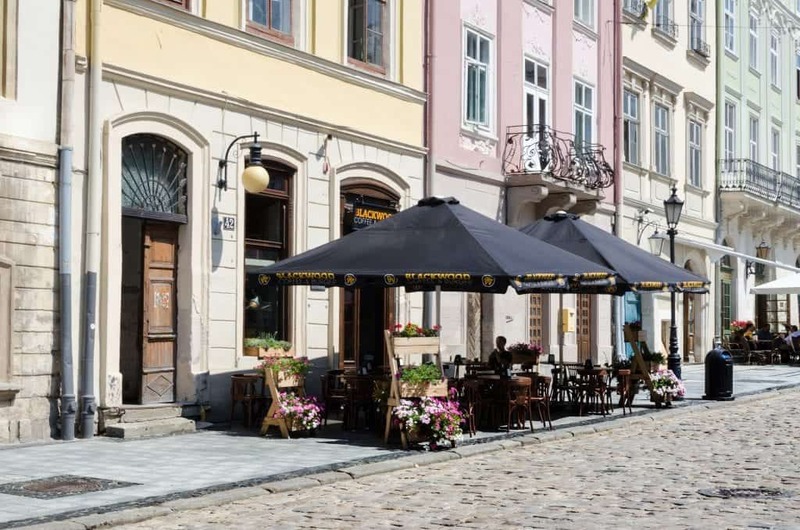 We are interested in more recent history of coffee though and bring you 5 cafés you should not miss during your trip to Lviv. It has been already 15 years that Markiyan Bedriy opened the first Svit Kavy next to the Lviv Latin Cathedral in the centre of Lviv. 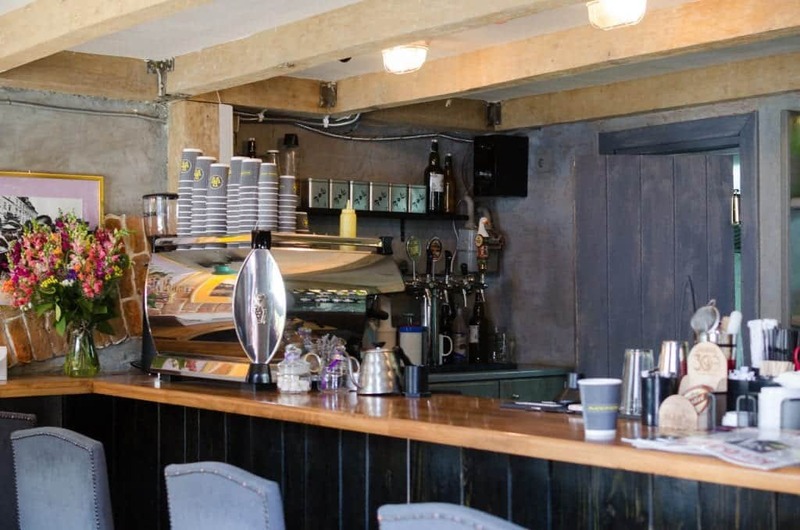 Over the years, the business slowly grew from a small café with 5 tables served by Markyan to the café spread over three floors, including a kitchen, a terrace and a shop. 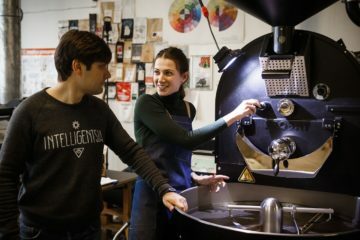 We were introduced to Svit Kavy during the Czech Barista Championship 2015 in Prague and it was obviously our first stop on our coffee tour in Lviv. 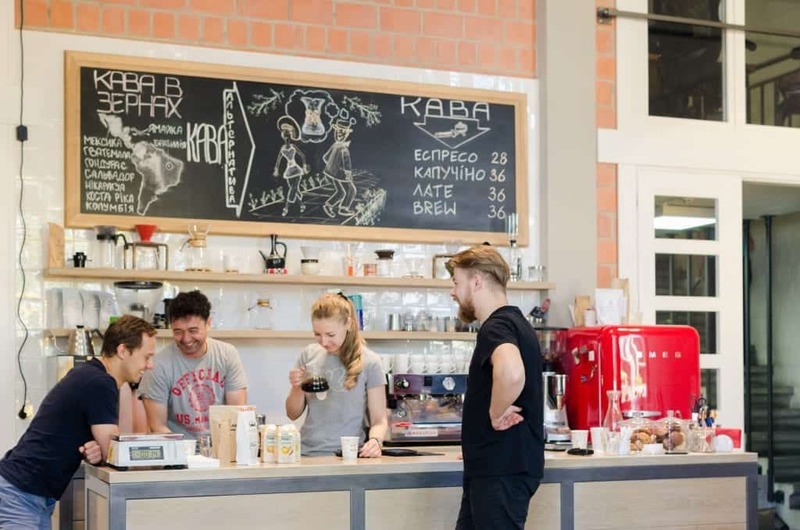 The ground floor and the terrace is a self-service area that allows you to explore the café from the inside where the bar is dominated by a red 4 group La Marzocco FB80 and 4 espresso grinders – 3 Mahkloenigs K30 and 1 Mazzer Robur. 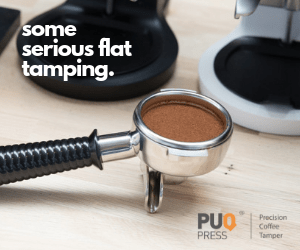 Baristas surprised us with serving only doubleshot espressos from naked portafilters. From the diverse selection of four single origin coffees (Ethiopia, Nicaragua, Honduras and El Salvador) we opted for our favourite Ethiopian Amaro Gayo espresso and cappuccino. The coffees were delicious the second time as well while we added some yogurt with fresh fruits and a nut cake from the breakfast menu. First floor is a lot smaller which makes it very intimate. It feels as if you had the bar for yourself. 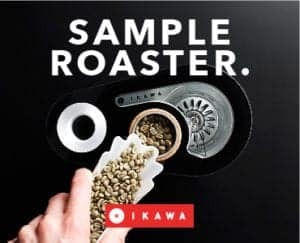 Traditional look of the back cover of Faema E61 is your first introduction to the space when you walk up the staircase to what seems to be a vintage collection of machines and grinders. 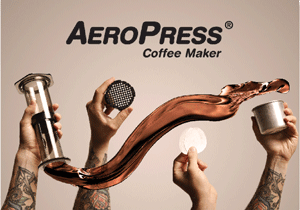 Coffee brewing is done in a rather modern style though. We tried perhaps all the remaining items on the menu, both hot and cold drinks, prepared with the coffees on offer and of course a cezve brew. 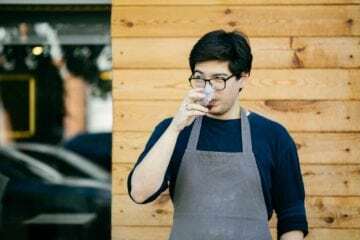 Keeping up to date with the current trends from Europe, Coffee Lemonade inspired by Da Matteo was recently added after the World of Coffee in Gothenburg. The café is well respected in the country. 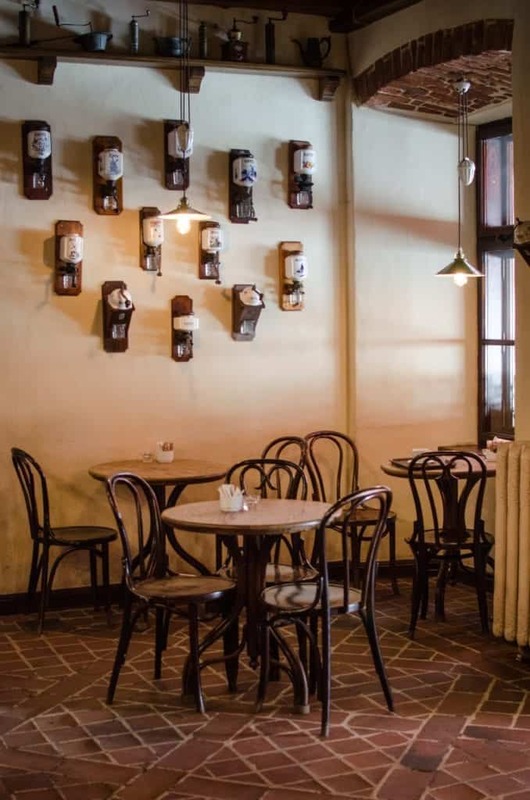 It has been three times awarded the best café in Lviv and it has got the title of the country’s best café once. It comes as no surprise that they serve over 10 kilos of coffee in the café and sell over 20 kilos in bags per day. There is a high chance that a good coffee you might get in Lviv was roasted by Svit Kavy. 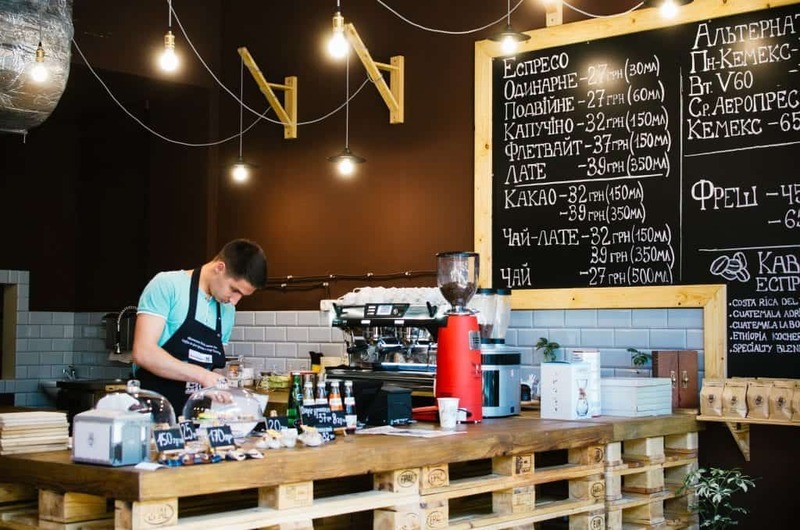 Just across the Rynok Square, you will find Blackwood Coffee that serves burgers and good coffee. Modern looking café with a terrace facing Ratusha Tower and Lviv City Hall. They also work with Svit Kavy that roast coffee specifically for them and at that moment it was a Hondurasian coffee for espresso. We were a bit confused if filtered coffee is also on the menu but Yura Logoida, the local barista, was happy to brew an aeropress if we waited several minutes for him to bring in fresh beans. 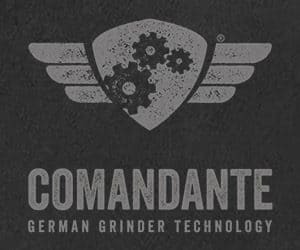 In terms of equipment, La Marzocco GB5 and Compak E8 were tools in disposal to Yuri, who wanted to make the second cappuccino for us the way he loves it, with less milk, and it was damn good! 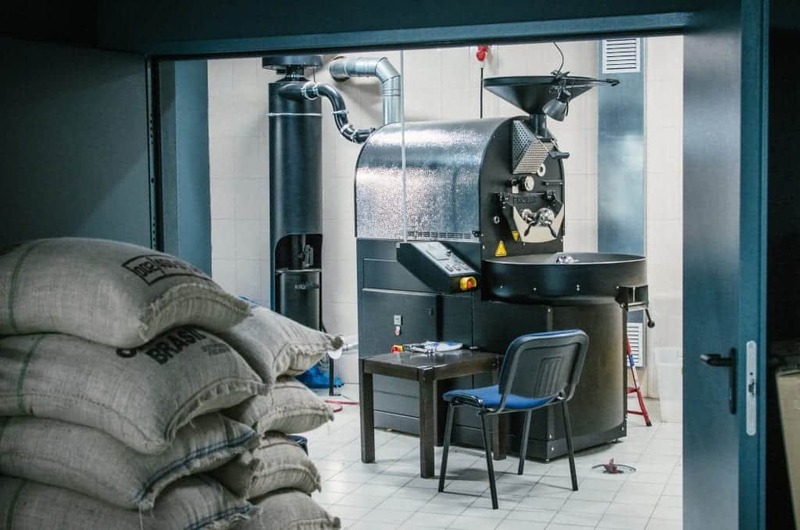 It will take you 40 minutes on foot or 10 minutes of adventurous taxi ride to reach Svit Kavy Roastery. 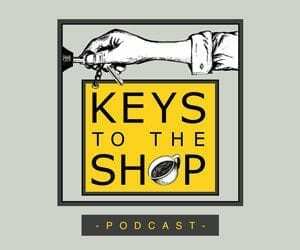 Entering the main door feels like entering your own living room but with two Giesen roasters next to the long coffee bar with La Marzocco Linea and Mahlkoening EK43 on it. What an idea of a living room, right? 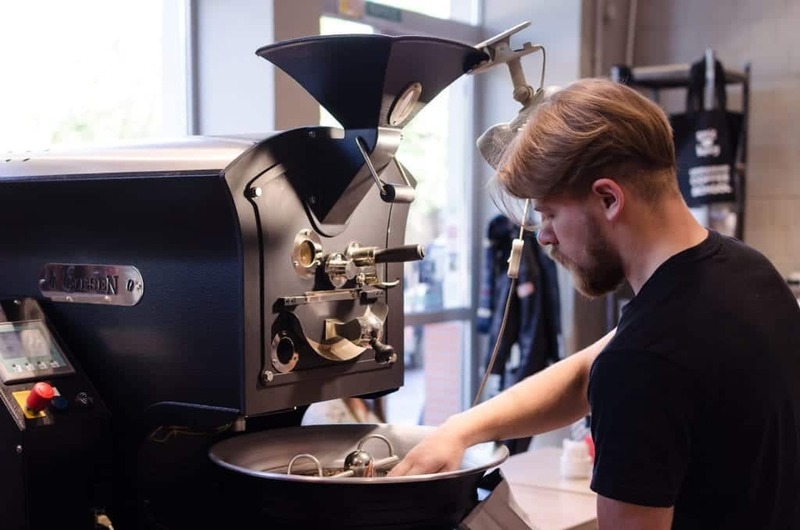 Head roaster Igor Berdnikov who placed second in 2015 Ukrainian Brewers Cup was just roasting fresh batch of Kenyan coffee and Yaryna Kozerema, head barista, was smiling behind the bar and offering us a coffee. Next member of the Svit Kavy’s crew, Annia Hale, stepped down from the office part of this multipurpose space followed by the owner Markiyan Bedriy who was eager to tell us stories and show pictures from his last visit to Amaro Gayo in Ethiopia. While drinking coffee and talking with our new friends we saw several people coming in and out rather quickly and without any coffee. 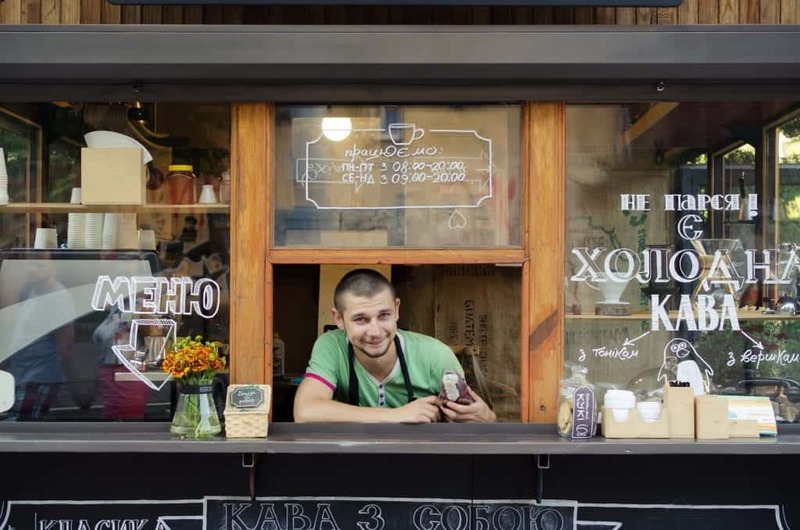 Markiyan confirmed that buying and drinking speciality coffee is still expensive for people and cafés and turbulent situation with their currency doesn’t help. 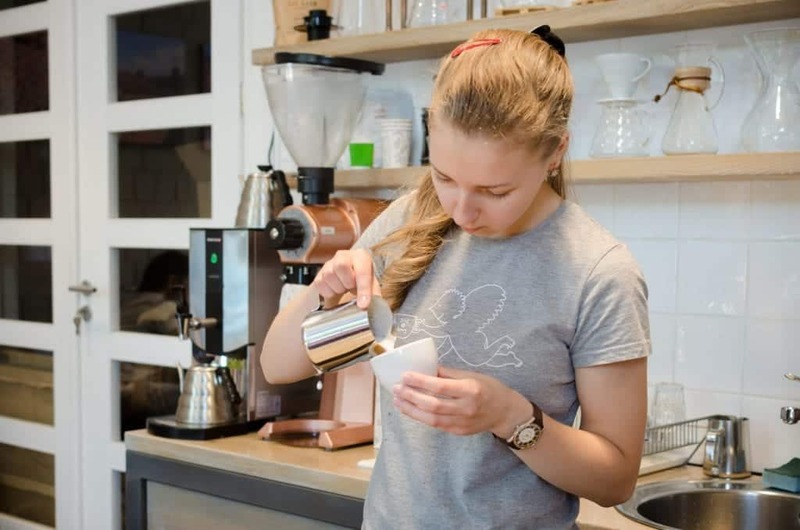 In order to educate more people about coffee, Svit Kavy is opening Ukrainian Coffee School in September and baristas were already promoting this initiative by wearing T-shirts with the logo of the school. 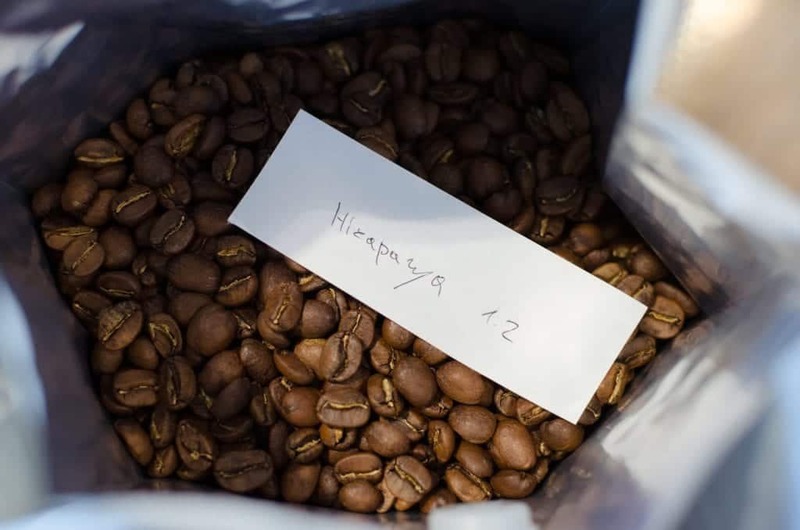 When we heard there is a new roastery in Lviv we thought of some small place that would buy few bags of coffee and try to find its way to the market. Chehovych is something totally different though! 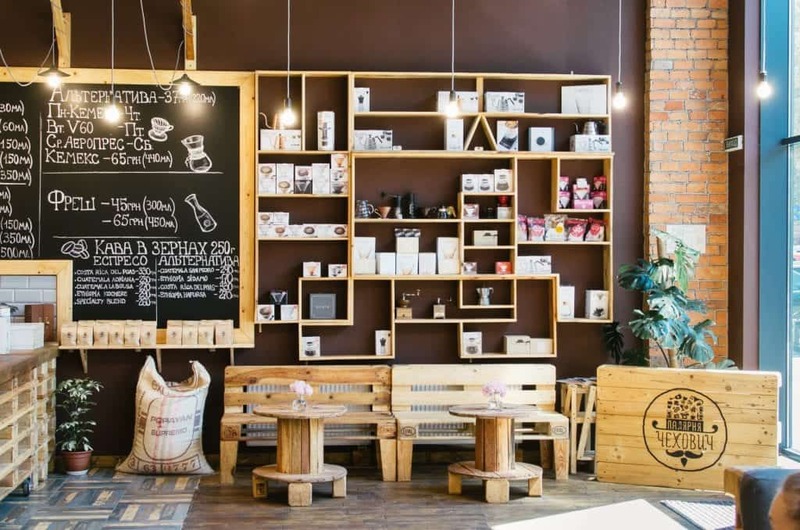 Two brothers, Daniel and Arsen Shlapak situated their café and roastery on the outskirts of Lviv but with the location that supports local offices with tasty coffee before work or after lunch. 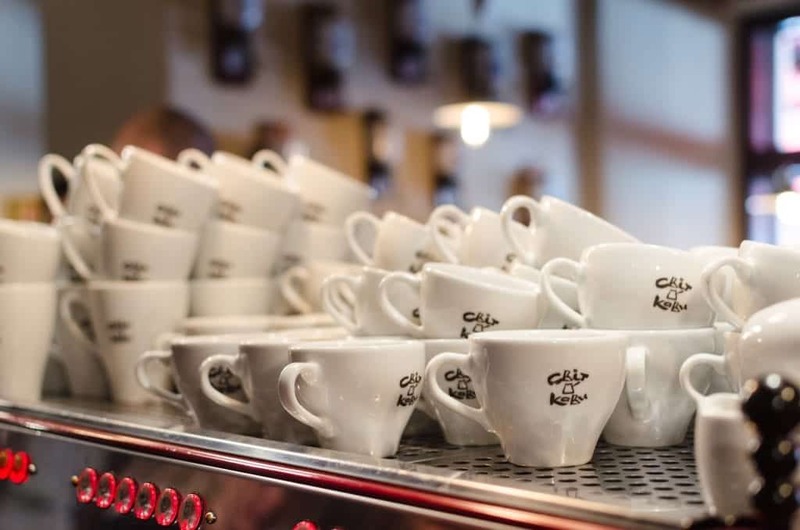 Named after boy's great-grand father the café offers generous space for every coffee lover who can choose from four coffees brewed in either a Chemex, an Aeropress or a V60 and three coffees for espresso are carefully prepared using Nuova Simonelli Aurelia II Competizione. We opted for Ethiopian Hafursa V60 brew by Nazar Shuliak and we weren’t disappointed. It’s not the first coffee venture for the family though. 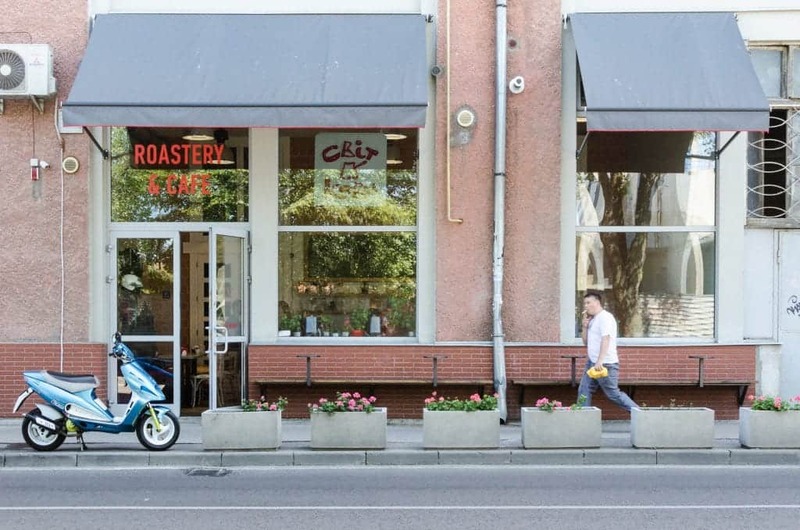 Arsen already successfully runs a coffee chain called Kredens, and the Probat machine in the back of the shop supplies the freshly roasted coffee not only to the bar in the front but mainly to several branches of Kredens. Several bags of speciality coffee remain a minority next to the pallets of commercial ones but its quality slowly gains its appreciation. Daniel hopes there will be more and more of it in the future. Imagine a tram or a bus stop, one that most people use in order to get to the city centre of every city. Usually, there is a kiosk selling pastry and bread for commuters. 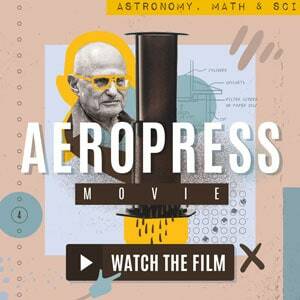 Sometimes you would get even a coffee to go but this coffee project of Ivan Blg and Svyatoslav Shchur is a different breed. 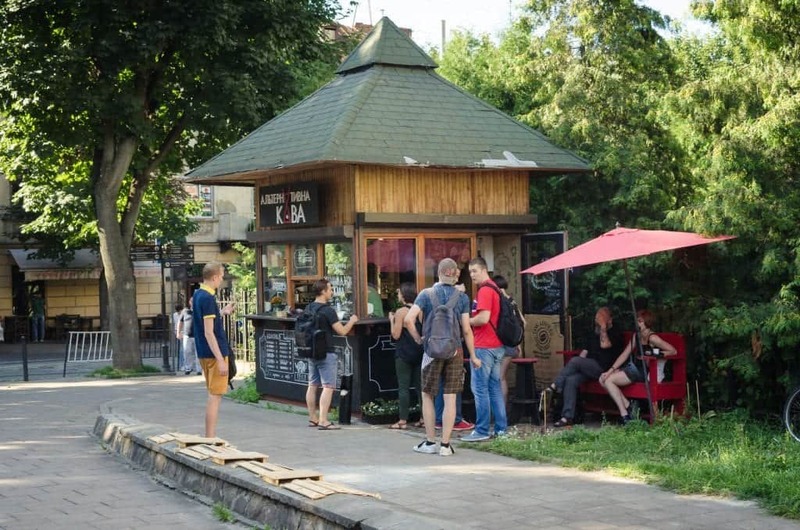 They have decided to proof that a café can be sustainable in selling coffee of high quality even outside of the city centre and they would like to see more of so called neighbourhood cafés in Lviv. The café has been open since January 2015 and both guys trying hard to proof it will work in the long run. During our visit they were serving coffees of the Funt Coffee Roasters from Dnipropetrovsk. 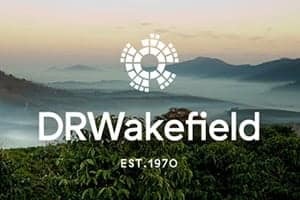 The blend of Ethiopian and Brazilian coffees for espresso and three single-origins to brew using pour overs, aeropresses, a chemex or a syphon. We tasted cold-brewed coffee that was mixed with tonic water and a slice of grapefruit, it was a great choice for that sunny and hot late afternoon in Lviv. 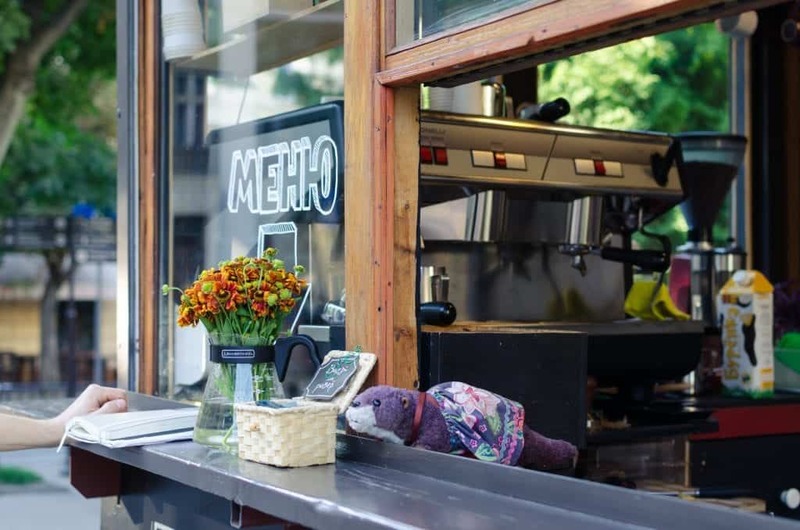 Even though it may sound like a coffee take-away concept, the guys have created a small garden next to the kiosk and the tiny place serves as a hub for coffee-related talks and discussions.